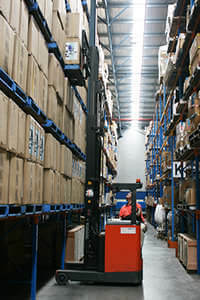 We can assist customers with short and long term storage nationally in Sydney, Melbourne, Brisbane, Perth and Adelaide. Convenience – Our warehouses are all located for easy access to local ports, airports, CBD and major arterials. Flexibility – We can take delivery of anything from a single pallet to full truck loads or container loads. Security – Visitors must sign in to enter the warehouse and all people on-site must display ID. Technology – Our Online Warehouse Management programme gives clients easy access to information on goods currently in storage and to a multitude of reporting options. Our Sydney, Melbourne and Brisbane warehouses have the added advantages of holding a section 77G depot license for sea and air freight, allowing us to store goods under customs bond. The Melbourne warehouse is also a licensed quarantine (AQIS) premises, allowing us to store goods awaiting AQIS inspection and or fumigation service. Our storage service links in seamlessly with Direct Couriers local and national delivery service. By consolidating suppliers, you have the added benefit of receiving one easy to understand invoice for both storage and delivery services, which means less administration for you. Whether you are looking for storage space as a short term stop gap or a long term outsourcing solution, contact one of our helpful team on 13 16 10 nationally to discuss your needs.